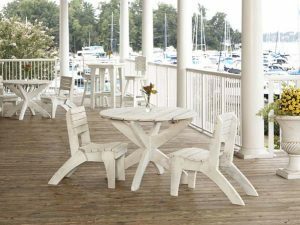 Get more value from your outdoor restaurant furniture by keeping your patio open longer! We know how valuable having those patio dining seats are for your business…and your bottom line. Bars and restaurants benefit from extending their dining space outside by increasing the number of seats available and therefore serving more people at a time, as well as satisfying customers who can enjoy a variety of dining experiences when they visit your establishment. Many bars and restaurants also take advantage of an outdoor smoking section, keeping their inside dining rooms smoke-free. Plus, you have spent a lot of time and money investing in the permit, design, and outdoor restaurant furniture for your patio – and you want to see it full every night! While summer months are the most popular for outdoor restaurant dining, we’ve put together a few tips for keeping your patio open for more of the year. This autumn, try these tips for extending your restaurant’s outdoor dining season. Consider adding a tent or screen. Contact your local rental supply company to see if they have any tents or screens available to fit your outdoor dining patio. Enclosing it for a month or two will help keep the heat inside (and your guests outside longer). Add patio heaters. Restaurants can purchase portable patio heaters that will keep guests comfortable, even on chilly nights. There are different designs on the market, but a basic black or silver patio heater will work great with any outdoor decor and keep guests on your patio for longer. Some models have an optional drink tray to make outdoor bar socializing easy. Build an outdoor fireplace. If you have the space and resources available, why not create a cozy outside fireplace? You can incorporate toasted marshmallows into your menu, or introduce a make-your-own s’mores bar. If you are winery or brewery, or if you specialize in coffee drinks, you may want to forgo the traditional tables and chairs and create an outdoor seating area with an outdoor sofa, great for sitting on with friends to share a toast in front of the fireplace. Feature outdoor entertainment. If you hire a musician to perform this autumn, position him on your patio. Host an outdoor Oktoberfest or Halloween party. Family-friendly restaurants can invite kids to participate in pumpkin decorating or leaf printing. Or you could feature patio-only specials to encourage more outdoor dining. Sports bars could even move a large TV screen and add an outside bar for Sunday afternoons. If there is an added incentive or entertainment to sit outside, people will naturally navigate to your patio. Your guests will appreciate the added effort you take to give them a chance to enjoy that fresh, crisp, autumn air. So get the most out of your outdoor restaurant furniture and extend the life of your outdoor patio!